This section describes the steps to install CNCnetPDM. Create a folder for CNCnetPDM on your PC or at a server. Due to Windows UAC please do NOT to use the directories ‘Program Files’ or ‘Program Files (x86)’ as CNCnetPDM should be able to run as a service under the ‘Local System’ account without any user logged on. 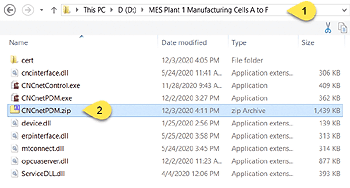 In the example below folder ‘D:\MES Plant 1 Manufacturing Cells A to F\’ (1) was used.